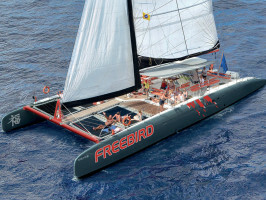 Enjoy an exquisite afternoon whale watching and dolphin spotting on board the most prestigious Catamaran in Europe. You will be made to feel V.I.P by our dynamic and delightful crew on-board this fabulous four and a half hour cruise along the captivating coast of Tenerife. Right from the very moment you get picked up from your hotel you will be in good hands. The experienced crew goes out of their way to ensure you are given a day to remember. The friendly and multi lingual crew are ever so knowledgeable and will delight in sharing what they know with you so as to make sure that you don’t leave with unanswered questions. You will spend the day lapping up luxury on this tailor-made boat. 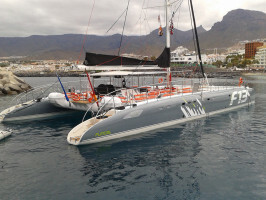 The boat has rather a decent size complete with a 38 metre high sail and it has copious amounts of space, in fact it boasts 620 square metres of it. 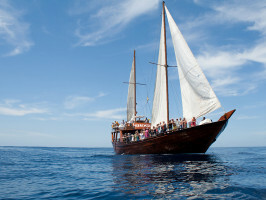 The big and beauteous boat comprises of two large decks and thus can hold up to 196 people. Whether you prefer to lull in the shade of the fly bridge, catch the rays in the netting area which is located at the very front of the Catamaran or cool down in the comfy indoor lounge; it’s really up to you. Tenerife is one of the only places in the world where the Bottlenose Dolphins and Pilot Whales co-exist within such close proximity to land. During the trip you’ll be able to lay back and watch in awe as you sail in style along the wonderful west coast of the island. You’ll get more than a glimpse of Mount Teide which is still very much an active volcano and stands as the highest point in all of Spain. If you decide to do this cruise in winter you’ll likely be able to admire the snow at the very peak which is perfectly fitting for a photograph. What’s more you’ll be able to see the 3rd highest cliffs in the whole of Europe: Los Gigantes which stand at a staggering 600 metres high. There’s absolutely no rush as you’ll have ample time to take photos and capture your moments on video as and when you wish to. The views from the flybridge are nothing short of breath taking and you’re sure to be blown away by the spectacular scenery. You’ll even be able to peak at the sailors sailing from way up high. Last but by no means least we shall make our way up North to the splendid Masca Bay where we shall stop for a while to refresh our batteries. After we’ve dropped the anchor, you’ll be served your lunch. Once you’ve rested your food why not try your luck at some snorkelling or take a swim in one of the most serene and secluded places in Tenerife. Meeting point: Puerto Colon, local nº227B. 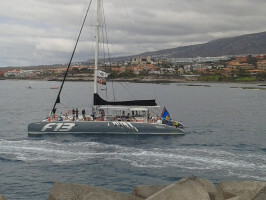 Costa Adeje.